The natural looking sheen on the leaves of this 5.5’ artificial large leaf philodendron plant will leave you wondering if it's real. Combine that with the leaves' real to the touch feature, and this is sure to be one of your new favorite faux plants. The large green leaves are uniquely stacked, giving this piece life and volume. Place the included orange planter in your front entry for a bright and natural greeting. 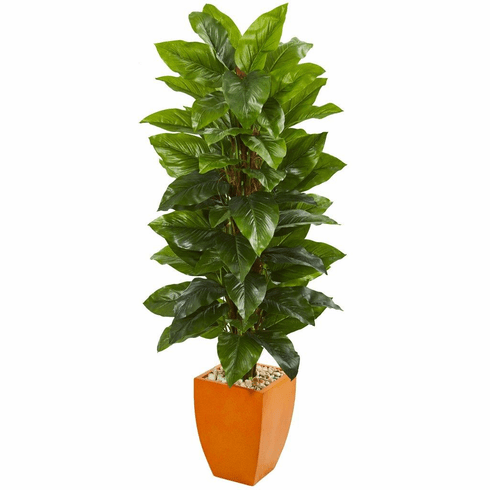 Height: 5.5 Ft., Width: 30 In., Depth: 30 In., Color: , Pot Size: H: 15.5 In. W: 12 In. D: 12 In.